tha MUNCHshop | Open for Business! Minor changes have been made to our website to better speak for what we’re all about. 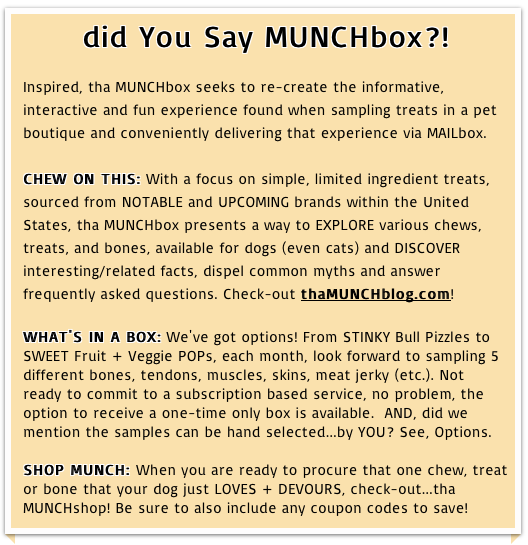 Looking to conveniently deliver, via MAILbox, the informative, interactive and fun experience found when sampling treats in a local pet boutique, tha MUNCHbox hopes to offer online customers a unique way to discover, explore and shop the many healthy, simple ingredient chews, treats and bones on the market. Feeling as though we were only showcasing pieces of a full-package, we’ve decided to tackle this issue by adding… tha MUNCHshop! NOW OPEN for BUSINESS, when the sample stage is complete, customers can procure single items or full size package items, directly from our website. Lastly, we do ask that you visit tha MUNCHshop often. We are constantly in the process of adding and/or finding new things. SMELLY TREAT SEASON IS ALMOST HERE! The other day we read this awesome post on GopetFriendlyblog.com called Train Your Dog To Be A Good Dining Companion! 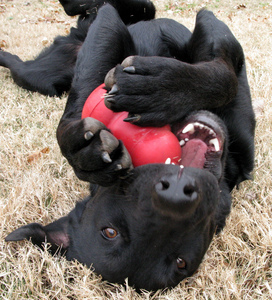 Although we understand that a stuffed Kong is a safe and considerate way to occupy your dog when dining out. We also say, bring out the SMELLY + MESSY STUFF! If the idea is to keep your pooch busy and distracted, then why not give them what they LOVE, smelly things! And, they obviously don’t mind getting messy. And to start allowing your pooch to MUNCH down on a STINKY FILLED HOOF or a CHEWY MOOOO TUBE, with plenty of fresh drinking water by his side. SUMMER is ALMOST in FULL EFFECT! A topic on our minds, we recently came upon this Great article about signs of stress in your dog. It’s true, some dog’s are not “smiling” or “happy” when their owners post photos of them with tongues out, teeth bare (etc.) If anything, your dog is probably wondering what in the heck are you doing?! Like some humans, not all dogs are…photogenic. I know I am not, whenever someone pulls out a camera, I personally…RUN. Don’t forget to check out – Dog Facial Expressions: Stress – posted by the same author. This Article will also give you some good pointers for signs of stress in your dog, like whale eyes or panting. It’s true that some dogs’ mouths open in a cute smile when they are relaxed and happy. But a dog with his mouth open could alternatively be panting from pain, stress, or fear. The following pairs of photos show my dogs stressed (left column) and relaxed (right column). The dogs have their mouths open in all the photos. What Sets Us Apart? | Product Selection! One of our values, is simple, healthy ingredients. If you didn’t recognize this trend during the April A-to-Z blog Challenge (we blogged about Chew, Treats + Bones), no worries, we have made a category for this topic to browse though. You can also check out the category, Chews, Treats + Bones…Oh My! You see, we like and understand the idea of sticking to the canine (and feline) natural diet. Yes, we know these beautiful domestic creatures have adapted over time, but we still think the basics are crucial and necessary. What do we mean by that? Well, one of the things that a canine must have in their diet is…PROTEIN! And we don’t mean the inappropriate protein from a veggie or plant source, we mean MEAT PROTEIN! So although a our furry companions are not able to eat fresh killed meat, straight form the forest like their ancestors, we are able to provide them with other sources of meat protein, like Chicken, beef, Fish, Lamb (etc.). On the other hand, one of the things that is NOT a crucial and necessary dietary need for a canine (or even a feline), is CARBS…even GRAINS (processed). Causes of the unhealthy pet epidemic, plaguing the life span of our pets (check out SlimDoggy’s Blog post Dog Life Spans), CARBS + GRAINS (processed) will be very scarce when sniffing around tha MUNCHbox. When we say we value simple, healthy ingredients, we mean we focus on products that are essential and beneficial to our canine (and feline) diet. As mentioned, MEAT PROTEIN is key, so you will definitely find many shapes and forms of different meat proteins (like liver, lung + hearts), amongst our products. Did you know that wild carnivores obtain fiber from the prey they eat. Fiber which comes from fur, nails, fins, cartilage, hooves, feathers, teeth (etc.). Although tha MUNCHbox doesn’t have any fur or feathers in stock (at least not at the moment), we certainly have HOOVES and TENDONS. We also have SWEET PAWTATO CHIPS, which isn’t a “wild” fiber, but one our furry companions have adapted to. Now, we know the issue of whether or not BONES should be consumed is a touchy subject. But, we agree with the fact that bones serve as a natural toothbrush, great for canine dental hygiene. I’d rather offer bones to gnaw on and tendons to chew on versus spending money on a toothbrush and nasty toothpaste (or even GREENIES), that doesn’t really do the job it’s suppose to do. So in all, will you find the typical packaged Chews, Treats and Bones sold in a pet store like Petco and PetSmart amongst tha MUNCHbox products? As previously mentioned, we focus on simple, healthy ingredient…limited ingredient Chews, Treats and Bones. We like these products to be pure, all natural, slow roasted and dehydrated. We don’t like carbs, processed grains, non-meat proteins, fillers, additives, or non-natural preservatives. 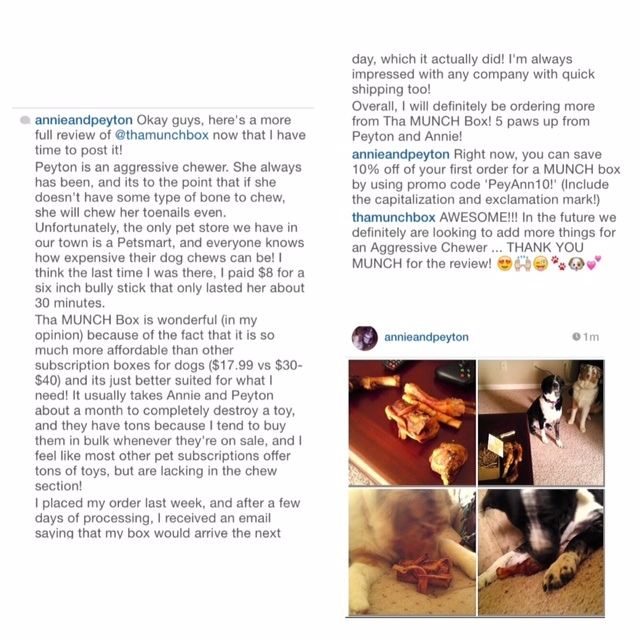 If you are all about yummy, healthy Chews, Treats and Bones for your canine (some of our products are feline approved), Check-Out thaMUNCHbox.com! A perfect chew for the small to medium sized dog, tha Hoof is renowned for its ability to NOT be easily consumed like a Bully Stick. 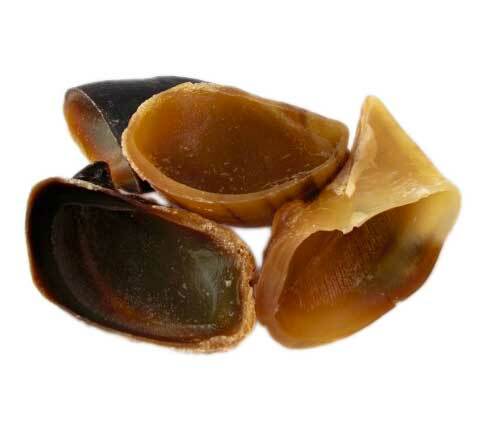 Although hooves are SUPER STINKY like a bully Stick (some even say worst), this hardened cartilage…keratin…toe nail, is a wonderful source of natural protein and is great for gnawing to promote dental health. Way better than a bone which may cause splintering concerns, hoofs soften when wet with drool, making them digestible. Even better, our hoofs come empty, which means you are more than welcome to add yummy fillings, like Pumpkin, Sweet Potato, Peanut Butter or even Non-Fat Greek Yogurt. You can also boil these bad boyz in Chik’n or Beef Broth to enhance the flavor! As with any Chew, MODERATION is KEY! To experience a hoof for your dog, as well as, other tasty treats, check-out thaMUNCHbox.com! We’ve made a WHO’s MUNCHIN page on our website! This is a small way of saying THANK YOU MUNCH to our supporters. I guess you can also call this page…OUR TESTIMONIALS. a POSITIVE way. Valuing Abundant Service to our customers, we Promise Patience and hope that in return, you will be Patient with us. Devoted to our MISSION + VALUES, we strive to provide nothing but tha BEST and we know that, tha BEST, in some cases, requires time (finding the right chews, treats + bones…doing our research). To see all of our COOL DOGGIES who’ve GOT tha MUNCHIES! Check-Out our WHO’s MUNCHIN’ page at thaMUNCHbox.com! Note: Use Code – FIRSTbox! for 10% OFF!